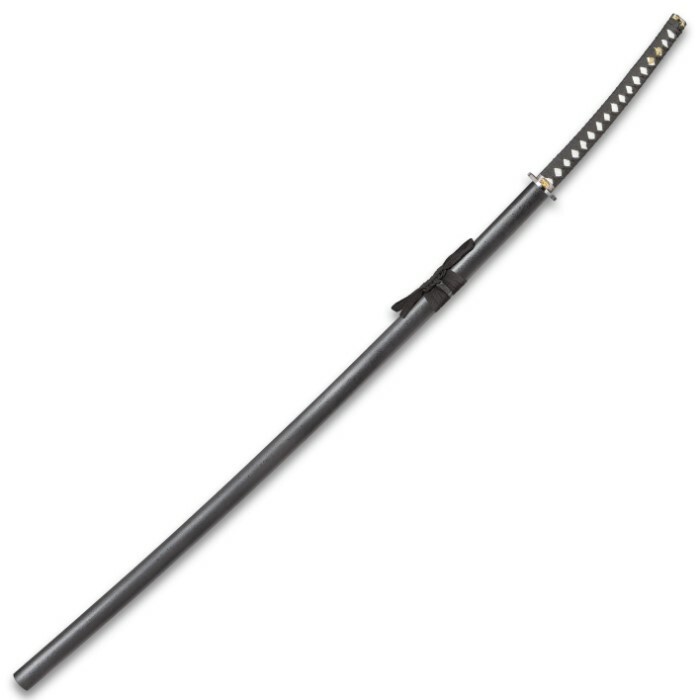 This Odachi Samurai sword is the ultimate weapon for ninja collectors. At 65 1/2" in overall length, it's probably the biggest sword you'll ever see! When someone walks into your house and sees this giant hanging on the wall, they'll know you are a TRUE sword collector! 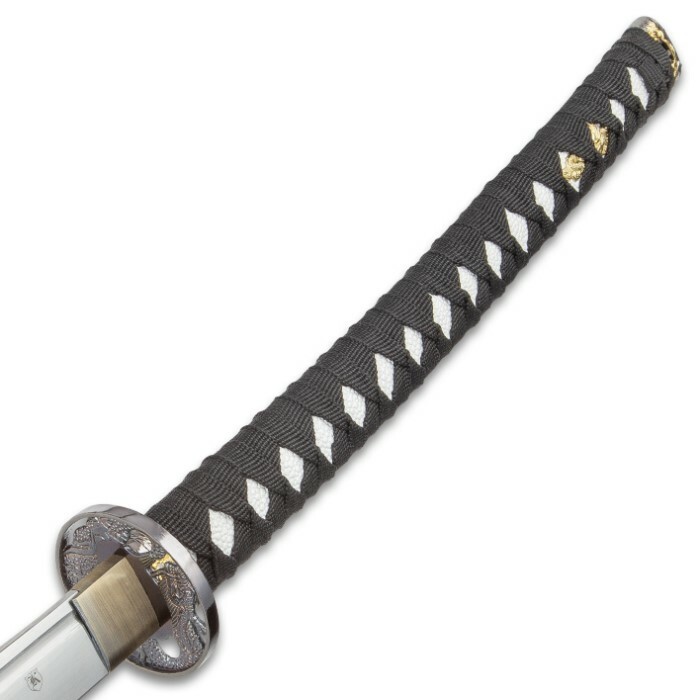 This unique sword offers a 49" fully sharpened steel blade and a traditional cotton cord and faux ray skin tsuka that is double pegged. The tsuba is cast with an ornate, oriental dragon reminiscent of early samurai art. 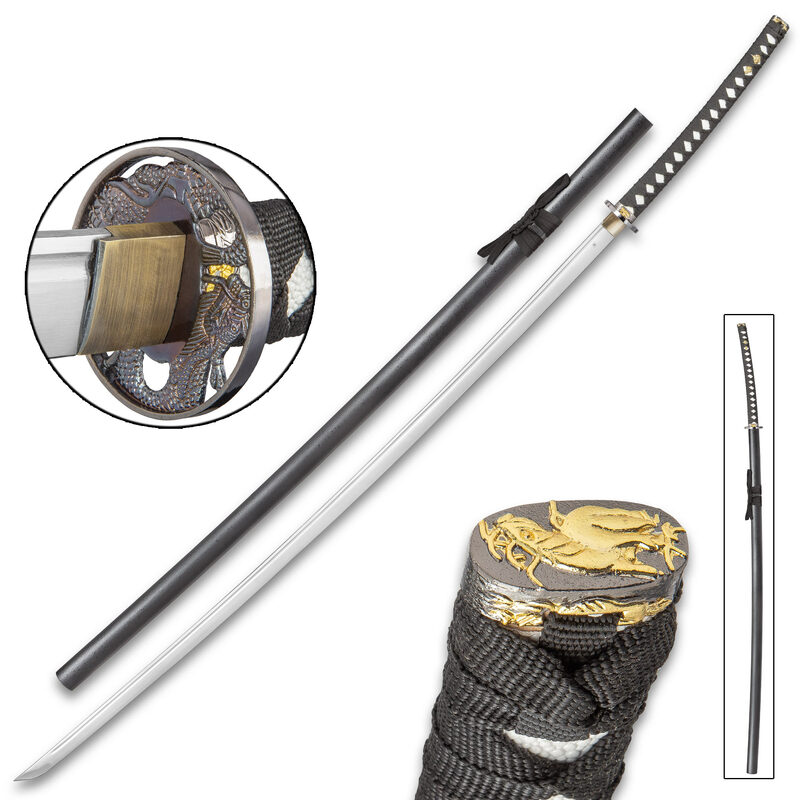 Each sword includes a lacquered wooden scabbard for storing your new favorite sword. It finally snapped half way down the handle. I switched from one direction to the other rather instantly and snapped it right at the tang. But I love it...so I'm trying to have a hickory reinforced handle fitted. this is worth every penny sadly when it was shipped the sheath cracked.. nothing wood glue couldn't fix so all in all worth it!!! awesome sword. it caught my eye because of the i beam design on the back of it, because it has that it is sturdy and stable. i have not tried to cutting through anything yet but i know it will be able to handle it. i was at first scared of the workmanship on the handle. i was nerves it would jiggle around, but it is sturdy and amazing. little disappointed that it had glue in the scabbard, but with a little work it will be clean. GOOD BUY WORTH THE DOUGH. i love this sword got it for Christmas last year its very weighty but not terribly so. it didn't come sharp but i quickly fixed that with my Japanese whet stone and a file . i love mine i haven't put it down since then. my gfs mother is scared to death of it. so overall a excellent sword. this sword is awesome in every way except it has a waxy substance when being drawn from the sheath. its heavy but not unwieldy its not sharp but that easily be remided with a belt sander and progressively finer grit of belts. all in all a excellent sword. Perfect for the price. The picture doesn't do true to this sword just because you don't really know the height of the woman. I stand 6'3" and it come up to my bottom lip. This is the perfect size and weight for us taller and stronger people. I'm loving it!! It doesn't come very sharp but so what. i just got this.. umm its ok.. the handle is a lil loose.. not very sharp.. but the blade is massive.. nice 4 the price..
overall, this is a good weapon. mine needed the wooden pegs replaced because the blade and guard kept coming out. but once that was fixed, it was good. the scabbard for it is a nice touch to go with it. gives it a more authentic feel.